Molinard is an old Grasse perfumery established in 1849, and still family-owned. Their best known fragrance is probably Habanita, which was introduced in the early 1920s. Tendre Friandise (Sweet Candies) was released in 2003; the notes are freesia, pear, lime, mirabelle plum, jasmine, sandalwood, amber, cedar, nougat, praline, white musk and vanilla. For the most part, I prefer my fragrances dry rather than sweet. The phrase "overly sweet" appears frequently in my own testing notes, and usually means that the fragrance was dismissed. But every so often I want a dose of candy, and when I do, I reach for this favorite from Molinard. Tendre Friandise starts with candied fruits, mostly pear, and I have to say that the start is rather perfume-y. It dries down to a creamy vanilla candy with light florals and lots of nougat and praline. There are quiet woody undertones and a very clean musk, and that is pretty much the whole story. It is sweet, but also soft once it calms, so I never find it overwhelming. What elevates it over some of the candy perfume competition is a bit of a spicy-peppery bite, perhaps from the freesia, which gives it a more sophisticated feel than say, Aquolina Pink Sugar. It is probably not a "great" fragrance by any objective standards. It will not inspire awe and wonder, and it will not make perfume history. But I would make the same claim for it that I would make for many others in my collection: for what it is, it is perfect. And sometimes you need a little candy. 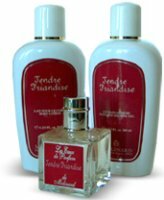 Tendre Friandise is an Eau de Parfum, and the lasting power is very good. I emailed Molinard earlier this year to verify that it was not scheduled to be discontinued, and they assured me that it was not, but it certainly is getting harder to find in the United States. It is currently available in a 50 ml bottle at hamptonct or perfumebay. Update 4/07: Tendre Friandise has pretty much disappeared from the United States; see Molinard Iles d'Or, or order it directly from Molinard in France. Lovely review R – as always!! Sadly this is not for me. As M pointed out above – it maybe the pear note. I love to eat pears but I cannot say I am fond of pear or most fruity notes in my perfumes. I must agree that it is soft but was tad too sweet on me. Hmmm..very interesting. I will have to try to find my sample to see if I can find a 'gourmand' I like as well. Nice to have a bit of candy once in a while. Thank you for a lovely review, as I have been curious about this fragrance. Sounds very nice! Sometimes one definitely needs a little candy. Or a lot! I too am not a big fan of sweet fragrances, but I liked this one too. The drydown, after the big candy opening subsides, reminded me of Lea St. Barth, my other sweet-but-forgiven cozy scent. Dear N, I don't usually like pear in perfume either. I have no explanation for my love of this perfume, LOL! F, I cannot decide if it is something I think you would like or not, but guessing the answer is no. V, I just can't picture you liking this either! T, I need to revisit Lea. I tried it ages ago and liked it but didn't love it. I really didn't think much of Lea when I first got it, but it really grew on me, to my surprise. I started out giving it a 3-star review, and I think I had to up it to 4 stars, because I wore out my whole sample and had to get more. It's such a simple, straightforward, almost cheap-smelling low-key vanilla-musk with a touch of almond, but it hit the spot. It's that sweatshirt effect I think I mentioned before. I actually like pear, love a bit of the sweet, but this one did not work for me. There's another fragrance that is similar to this one that I like much better, and I probably have a bottle of it. But for the life of me, I cannot remember what it is! LOL! Maybe it is Lea St. Barth. I like that one a lot better! R, I can´t detect any pear when I´m wearing it – which isn´t too bad because as others mentioned before I´m not so fond of smelling it in a perfume, too. I think I told you before that for about 1/2 an hour or so, Tendre Friandise smells really awful on my skin, sharp &…welll…awful But when it settled down, it´s a nice fragrance, definitely sweet, but in a good way & not too foody. You really found the right words to decribe it! R, I think most people do like Lea better. I will try to revisit that one this week. I know I didn't love it the first time I tried it. Yes, the sweatshirt effect. Sage Pearl is the same for me. “and usually means that the fragrance was dismissed.” Well this will sound silly, but that instantly put a picture into my head of you being a perfume school marm – Dismissed from class! To the back of line, you! God, R wearing candied gourmand scents – whatever is the world coming to? I liked the Molinard Musc et Fruits a lot better. I don't like the pear note in most fragrances, that probaly killed it for me. T, I have not tried that one. I did try one other in the series, Verveine en Fleurs, and didn't care for it very much. Thanks, the shipping from Molinard is too steep for me, but nice to know it is still available as it has just about disappeared from the US.